The answer to the exercise will be included and explained if you attend the course listed below! Dudley (shown highlighted) was the leave area with the highest absolute difference in votes between leave and remain, but it was only 6th in order of absolute difference in votes cast. To do this, you'll need to derive the Status column shown above, and also calculate the absolute difference and sort by this. If you're feeling brave, you could continue without turning the page for help! A suggestion for how to solve this problem - a guide to each step follows. 1 Import the Excel workbook contained in the folder at the top of this exercise. 2 A conditional split to determine if the leave votes exceeded the remain ones. 3 A derived column transform to create a new field called Status, and set it to Leave. 4 A derived column transform to create a new field called Status, and set it to Remain. 5 A Union All transform to unite leavers and remainers (if only it were that simple). 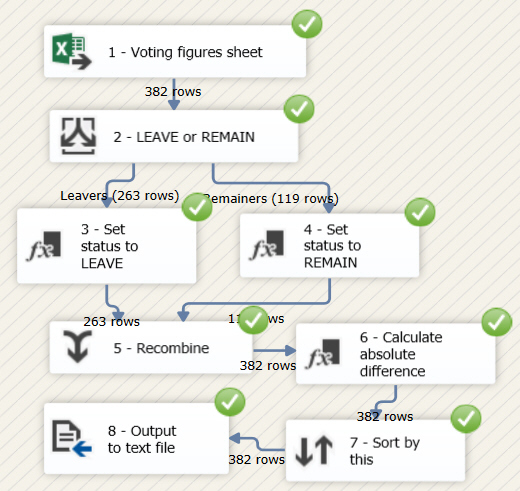 6 Use the ABS function in a derived column transform to work out the difference between leave and remain votes, ignoring any sign. 7 Sort by this newly calculated column. 8 Send the output to a new flat file. When everything's working, close down the package and (if a remainer) shed a little tear.